卵The recommended wrist size is between 5.7 inches to 6.9 inches shall fit perfectly. If you have a bigger or smaller wrist,maybe the elastic cords will work tighter or looser. 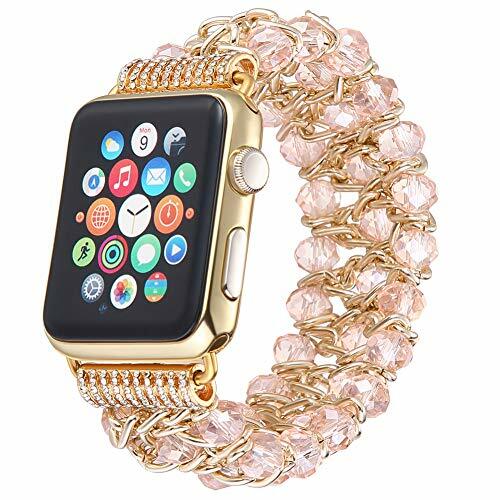 卵Made of high quality alloy and artificial crystal beads, durable elastic rope,making your iwatch look luxury and elegant.Durable elastic rope makes you feel comfortable. 卵The band for iWatch comes with watch lugs on both ends, which locks onto Apple Watch interface precisely and securely. Easy and direct installation and one button removal. 卵Suitable for Apple Watch Series 3, Apple Watch Series 2, Apple Watch Series 1, Apple Watch Nike+, Apple Edition, Apple Watch Hermès + all version. 卵This stylish dressy apple watch band is perfect for girls and women,ladies. Suitable for grand events like Wedding, Anniversary, Valentine\'s Day, Party, etc.